Would you eat this new KFC Cheetos Sandwich? After the success Taco Bell had (and continues to have) with their Doritos Locos Tacos, the fast food industry has tried to feature various chip products in their menu items. Naturally, that led to many Cheetos-related food items. In 2016, Taco Bell released the Cheetos Burrito in an attempt to replicate their Doritos success, and Burger King introduced the Mac ‘n Cheetos bites and Cheetos Chicken Fries. In 2017, Taco Bell gave a Cheetos Quesadilla a try, Chuck E. Cheese came out with the Cheetos Pizza, and Regal Cinemas even released Cheetos Popcorn for moviegoers. 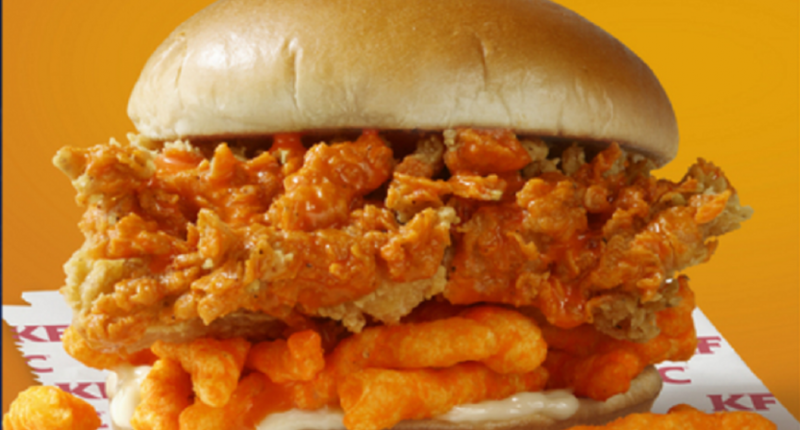 Now, the Cheetos Sandwich is a thing, thanks to Kentucky Fried Chicken. KFC is testing out the Cheetos Sandwich at selection locations in North Carolina (Greensboro and Raleigh), Virginia (Richmond and Roanoke), and Georgia (Greenville). In case you were curious about the @kfc #CheetosSandwich – I filmed myself trying it this morning. Matt is an editor at The Comeback. He attended Colorado State University, wishes he was Saved by the Bell's Zack Morris, and idolizes Larry David. And loves pizza and dogs because obviously. He can be followed on Twitter at @Matt2Clapp (also @TheBlogfines for Cubs/MLB tweets and @DaBearNecess for Bears/NFL tweets), and can be reached by email at mclapp@thecomeback.com. "GOOD GOD, THAT'S JEFF FISHER'S MUSIC!" How concerned should the 2018 MLB Postseason teams be about their starts to the 2019 season? Nolan Elingburg of the Blue Devil Network and his wife Danielle got Zion Williamson to dunk and reveal the gender of their baby. An offside call nullified a late Raheem Sterling goal that would have sent City through.